A Day In The Life Of...: Hercules!!!! 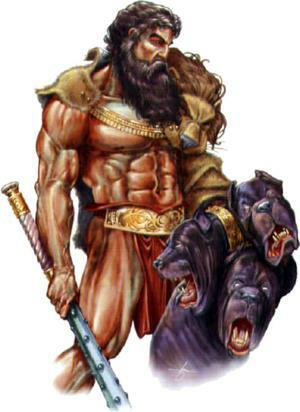 In mythology Hercules, also known as Heracles, is an illegitimate son of Zeus, by a mortal woman named Alcmene. Hera, extremely jealous of her husband's extramarital activities, attempts to murder the child by sending two snakes to kill him, however, as a half-god; Hercules is blessed with superhuman strength and is able to defend himself. Upon reaching adulthood, he joins the Argonauts and embarks on many different adventures throughout the many myths; ultimately he becomes an Olympian God (the one of strength) and a constellation. He has a fit of madness and kills his wife, Megara and his three children, and for penance he must complete a series of trials. 1. Slay the Nemean Lion and bring back its hide, the lion's hide was unbreakable and could not be pierced by any weapon. 2. Slay the 9-headed Lernaean Hydra. 3. Capture the Golden Stag of Artemis. 4. Capture the Erymanthian Boar. 5. Clean the Augean stables in a single day. 6. Slay the Stymphalian Birds. 7. Capture the Cretan Bull. 8. Steal the Mares of Diomedes. 9. Obtain the Girdle of the Amazon warrior queen Hippolyte. 10. Obtain the Cattle of the Monster Geryon. 11. Steal the Apples of the Hesperides, which were strictly guarded by a 100-headed dragon called Ladon. 12. Capture Cerberus, the guardian dog of Hades, using no weapons and bring him back.